In my previous blog post I mentioned that I have started a new project. This "new project" has been crawling around the back of my mind for almost 8 years. I didn't know it, I didn't always recognize it, but as I'm putting story elements together, finding out about these characters, and discovering the world they live in I realize I've been waiting to write this story. See, eight years ago (this fall it will be eight years) was my first semester in college. In my free time between classes, rehearsals, and work I always kept my eye on the prize: my writing. But my first semester in college I only had the vaguest shadows of an idea. It ended up being an idea that I scrapped and sold for parts to the better part of my brain, but as I was searching for the idea I would create little writing exercises for myself. In part I did it hoping to "happen upon" a good story, but basically to keep my creativity finely tuned. My favorite of these exercises was to take showtunes from my vast musical library, put them all on a playlist, hit shuffle, and make a story out of the first 21 random songs that played. I'm a theatre-kid, and musicals (good musicals) use song to progess a story. So I would string together a unique story from disparate pieces of other stories, using characters of my own creation. It really was great fun. So that's what currently preoccupies me... What has inspired you in the past? Where does your Muse find her/his voice? Great post and great ideas! My hubs is more the musical-aficionado but there are some I like too, and certain songs (not from musicals) have definitely inspired parts of my books. In one I have chapter titles based on songs and they also reflect that POV character's growth through the story. Wow, I think I'd like to read your dystopian. It sounds like my kind of thing. Sounds like you've got a great Muse. I get my ideas from various places - a lot of them from life experience. I will often draw on experiences I've had in my life to create stories and characters. 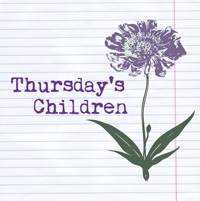 Thanks for joining us on Thursday's Children. I am a total musical theater geek; I love everything about it both onstage and off. In college I got the chance to write and direct a revue for the late-night theater slot; it was a sung-thru using all of Gershwin's music and giving a vague storyline of a speakeasy in 1920s New York. Watching it come together was one of the most rewarding experiences ever and I definitely think a lot of the same skills are involved between musicals and novels. Go get'em!